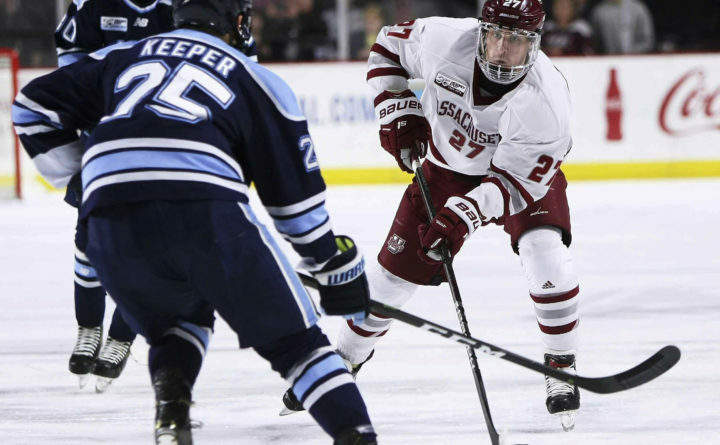 Massachusetts' Jake McLaughlin skates with the puck in front of Maine's Brady Keeper during the fist period of a college hockey game Saturday, March 2, 2019, in Amherst, Mass. 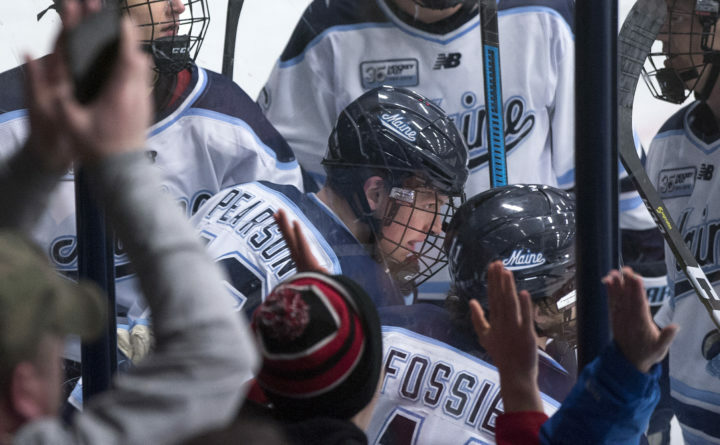 The University of Maine’s Chase Pearson (center) celebrates a goal with linemate Mitch Fossier and other teammates during a Jan. 21 game at Alfond Arena in Orono. Pearson, Fossier and Eduards Tralmaks make up UMaine's top scoring line. Two days after being eliminated from the Hockey East quarterfinals by Northeastern University, the University of Maine men’s hockey program has lost its Nos. 2 and 3 scorers early to pro hockey. Sophomore defenseman Brady Keeper has signed a free-agent contract with the National Hockey League’s Florida Panthers and junior center and co-captain Chase Pearson has signed a two-year entry level contract with the Detroit Red Wings. The 6-foot, 195-pound Keeper, a native of Cross Lake, Manitoba, was scheduled to fly to Dallas to join the Panthers for Tuesday night’s game against the Stars. Detroit’s 2015 fifth-round pick (140th overall), is expected to join the American Hockey League’s Grand Rapids Griffins later this week. The 6-2, 205-pound Pearson, a native of Alpharetta, Georgia, led the Black Bears with 16 goals in 34 games and his 29 points were second behind linemate Mitch Fossier (36 points on 8 goals, 28 assists). The two-year captain topped the Black Bears in power-play goals (5) and provided two assists with the man advantage. He had two game-winning goals along with two game-winning assists. Pearson provided 10 goals and 10 assists in 22 regular-season league games and led the team in plus-minus at plus-21. The son of former NHL player, Scott Pearson is also a valuable penalty-killer and faceoff man. He scored 37 goals and added 41 assists in 107 career games. Pearson was the team’s No. 2 point producer during the 2017-18 season (7 goals, 20 assists), and as a freshman was second with 14 goals and fourth with 22 points. Keeper was the Black Bears third-leading scorer this season with 22 points on seven goals and 15 assists. Five of his goals and 11 of his assists came during UMaine’s 24 Hockey East regular-season games. He played on the power-play and penalty-killing units, and was one of the Black Bears’ top point-producers on the power play with two goals and six assists. Keeper also was among the team leaders in game-winning points with six (1 goal, 5 assists). Keeper amassed a team-high 58 penalty minutes in 36 games but had only 26 in 24 Hockey East regular-season games. Keeper scored UMaine’s only goal in Friday night’s 2-1 overtime loss to Northeastern in their best-of-three Hockey East quarterfinal series against Northeastern. Northeastern eliminated UMaine 2-1 on Saturday night. 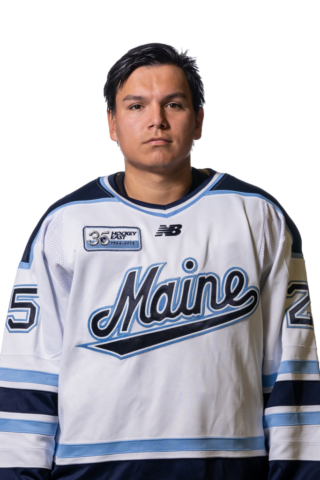 Keeper, an exceptional skater with an NHL-caliber shot, tallied two goals and three assists in his past five games with UMaine. This was the second straight year he led Black Bear defensemen in scoring. He registered 22 points on six goals and 16 assists as a freshman. 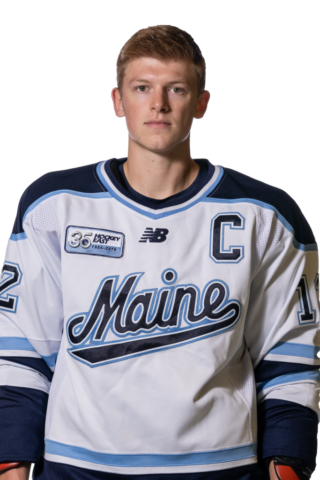 With Florida, Keeper will join former UMaine All-American defenseman Jack Capuano, the former New York Islanders head coach, who is an assistant with the Panthers.